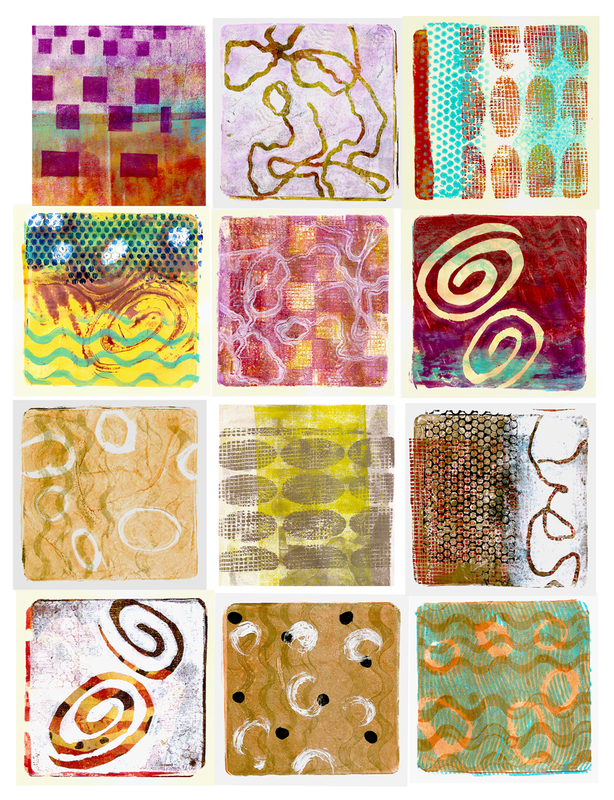 Another session in the studio this morning yielded another stack of fun prints with my Gelli Plate. Some of them might be considered “art” but I will cut up most of them as parts of collage. I’m thoroughly enjoying adding to the collection of delicious collage papers. I love the complexity achieved by layering many prints on one sheet. Here’s another fun demonstration of gelatin printing that’s packed with ideas for pattern creation and layering, Gelatin Printing with Wendy Shortland. The gelatin print plate and the Gelli Plate involve the exact same processes. These are so awesome Martha! This is really pulling me to experiment with. What kind of paper are you using in the above prints? Just curious which weight and types of paper pick up the monoprints the best and what type of paper you prefer working with the most. Thanks for sharing your process with us! Thanks, Itaya! So addictive, I tells ya. The papers you’re seeing in these pictures are just heavy stationery paper that I had lying around. I mainly want these for collage anyway, so I didn’t want them to be too heavy. But paper that’s a little heavier would be stronger and hold its shape better, like maybe 70 lb. rag, etc. Notice too that I didn’t worry a lot about registration. There are ways to get the plate to contact the paper in the precisely right place each time. I love that video. She is adorable. So you talked me into it. I have to get a gelatin print making gizmo…………..
Roberta, I promise you won’t regret it! Brava! They are wonderful…love the yellow w/ ovals. Martha, how is the clean up? Is it as easy with soap & water or hand sanitizer as they say? Nicole, it is every bit as easy. I just keep a clean(ish) wet paper towel handy to wipe the plate between prints. A spritz of water directly on the plate speeds up cleaning even more. I don’t have the hand sanitizer, but when I remember to pick it up I’ll get some. Baby wipes are good too, so they say. But plain water works too. Amazing! The only thing I would add is that when the paint starts to dry on the plate, it takes a little bit more effort to rub off with the water and paper towel. The cheap paints made for crafts are very fast drying. I also want to get some retarding medium, which will help too. I agree about the surprises brought about by the off-register prints. I enjoy those!